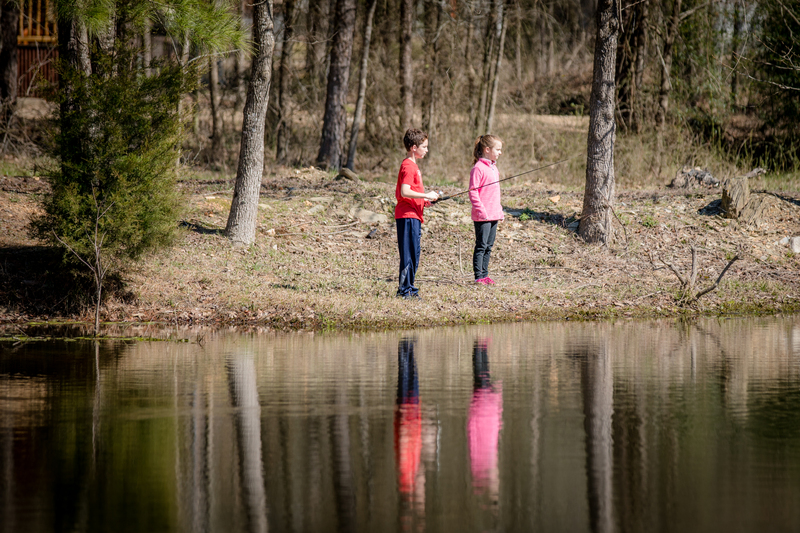 Lost by the Pond in Broken Bow, Oklahoma, was the name of the little cabin we stayed in on our Spring Break adventure to Oklahoma. It was the perfect little getaway for me and my family of four. Every year, I try to think of something fun (and simple) to do for Spring Break. Sometimes, it’s as simple as a visit to the zoo or the arboretum, but sometimes, I like to get out of town for just a few days. This year, I was ready to get out of town, so as I began looking around, I kept coming back to the cabins that so many people had mentioned to me in Broken Bow, Oklahoma. Our trip last year to the teepees in New Braunfels was fun and very interesting, but I wasn’t sure I could convince my husband to go anywhere without a concierge this time. I would’ve happily gone back and reserved another tipi through Reservation on the Guadalupe, but I knew that I would most likely be traveling alone if that is what I chose to do. I decided to be brave and go for it, so I booked us a cabin in Hochatown, Oklahoma, in a little “resort” area called Friendly Pines Cabins located near Beavers Bend State Park. I looked through all of the choices they offered, and the cabin called Lost by the Pond sounded like it might be a good fit for us. Here’s the view of Lost by the Pond, from across the pond! Nice, right? It was described on the Friendly Pines Cabins Website as “our newest Family Friendly cabin (construction completed Fall 2014). Indoor Hot Tub. Sleeps six. Two bedrooms, two baths. Two queen beds and one sleeper-sofa. Fully-equipped kitchen. Central heat/air, cathedral ceiling, ceiling fans, hardwood floors, cable tv, and wood burning fireplace. I booked our cabin, and did all of my communicating with the owner through the Home Away App. It was so easy. I just downloaded the app, and all of the information I needed was right there on my phone, including the contact information for Traci, the owner of the property. When we arrived, we were immediately greeted by Tracie and Ronnie, the owners. They met us at our cabin and walked us through the property telling us all the little things we needed to know. In addition, they told us about lots of local places to eat and things we should be sure to do while we were there. They were so very friendly and helpful. We immediately knew we had made a good choice to come stay here. On Tuesday morning, we were out walking around, and my daughter was pretty tired, and Tracie came out with some hot chocolate packets for her. Just a small gesture, but it meant the world to my daughter (and to me). The hot chocolate perked her right up. Sounds perfect, right? Right. It was absolutely perfect for my family. There are so many things that worked out for us, the most important being the proximity to the pond. With two kids who love to go fishing with their Daddy, this was the most perfect thing about Lost by the Pond. The pond was so close, that we could monitor the kids from our porch! The pond was right outside of our cabin, so I was able to sit on the porch swing and relax with my diet Coke from the EZ Mart down the road, while the kids played with Dad at the pond. I felt like I was right there with them, while also getting some time to relax. The weather was a bit colder than we expected, so the plans for swimming did not work out. There are several swimming holes nearby with a beach-like feel (and look) to them, but it was just too cold. But…that was not a problem, because there is plenty of other things to do in the area. I think one of my chidren’s favorite things was just driving to different parts of the lake and the various creeks exploring the area. We found lots of little “nooks” with cool rocks, sticks, pine cones, and all sorts of “treasures” that always seemed to make their way back to my car! Finding places with good skipping rocks was a big hit too! I can’t tell you how many hours we spent skipping rocks. I also can’t count how many times I heard “Hey Mom…watch how many times this one skips”! Just a bit farther down one of the main roads, you will find Beavers Bend State Park. This was a big hit with our kids, because in this area you can rent Pedal Boats, Kayaks, & Canoes! And just a bit farther down the road at Beavers Bend Depot, you can rent horses, ride a train, and enjoy some yummy ice cream! A picture of our sweet little conductor who made us all smile and laugh! Beavers Bend Depot was lots of fun. In fact, we spent quite a bit of time in this area. They have trail rides, a train, a small gift shop, as well as some yummy snacks, including Blue Bell Ice Cream! To get more information on this area, you can visit the Broken Bow Lake – Beavers Bend Depot & Stables Website. Beavers Bend Depot is located inside of Beavers Bend State Park off of Highway 259A in the main area of the park. 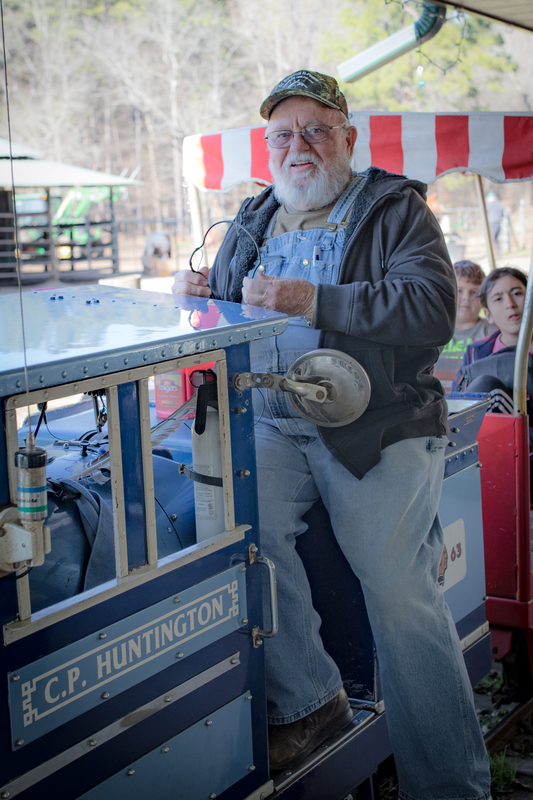 The train depot and stables have train rides and horseback rides throughout the day. The train ride is a 15 minute ride around the park through the trees. We enjoyed this! The train conductor is a really nice man with lots of funny anecdotes he shares throughout the train ride. We found him to be quite entertaining, as well as informative. And be prepared for “Wahoo Hill.” That was probably my favorite part of the train ride. We also went on the horseback ride. It was very “exciting.” It lasted about an hour, and our horses walked us (very slowly) over a 2.5 mile trail within the park. It was pretty funny, because the horses we were given seemed to match our personalities. My daughter, who is chill and not bothered by anything, was on a horse named Ranger. Ranger was the slowest, most relaxed horse they own! My son, was on a horse named Champ! Champ was quite feisty. He nipped at other horses, and was always trying to pass Ranger. Very fitting, since my son could also be described at feisty! You can also get more information from the Beavers Bend Depot Facebook page with some details on the trail rides, train schedules, and other things happening. Overall, the trip was a total success. Unfortunately, we only booked Lost by the Pond for a few days. We were being cautious, and didn’t want to stay too long in a place we didn’t like. Once we got there and got settled, we all found ourselves wishing we had booked it for the entire week. Now we know for our next visit, when we will for sure be staying a lot longer!